Fire Phone boasts a 4.7-inch IPS 720p touchscreen with 590 nits of brightness, a Qualcomm Snapdragon 800 chipset with a 2.2 GHz quad-core CPU and Adreno 330 GPU, and 2GB of RAM. It has support for 4G LTE. The handset's frame is made from rubber, and a sheet of Gorilla Glass 3 is present both on its front and on its back. The buttons are made of anodized aluminum. The rear camera is a 13MP f/2.0 unit with a five-element lens, and it comes with optical image stabilization as well as a dedicated hardware button. Amazon is throwing in free unlimited photo storage in its Cloud Drive. The Fire Phone has two stereo speakers on the front with virtual surround sound. The earbuds that come in the box have a tangle-free cable and they snap to each other thanks to built-in magnets. 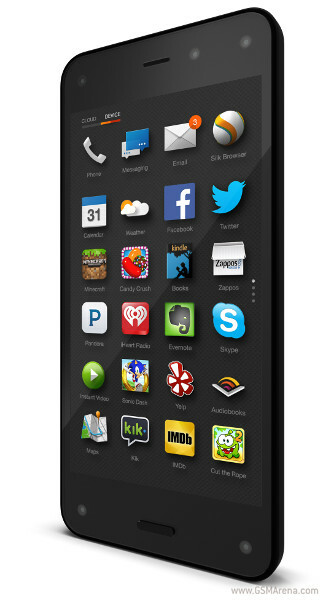 The Amazon Fire Phone runs Fire OS 3.5, which seems to be the same OS used on the Kindle Fire line of tablets. It's based on Android but lacks any of the Google's services. So, who can’t wait to trade over 1.5 million apps for 23 that have been ported from iOS to yet another forked Android device?